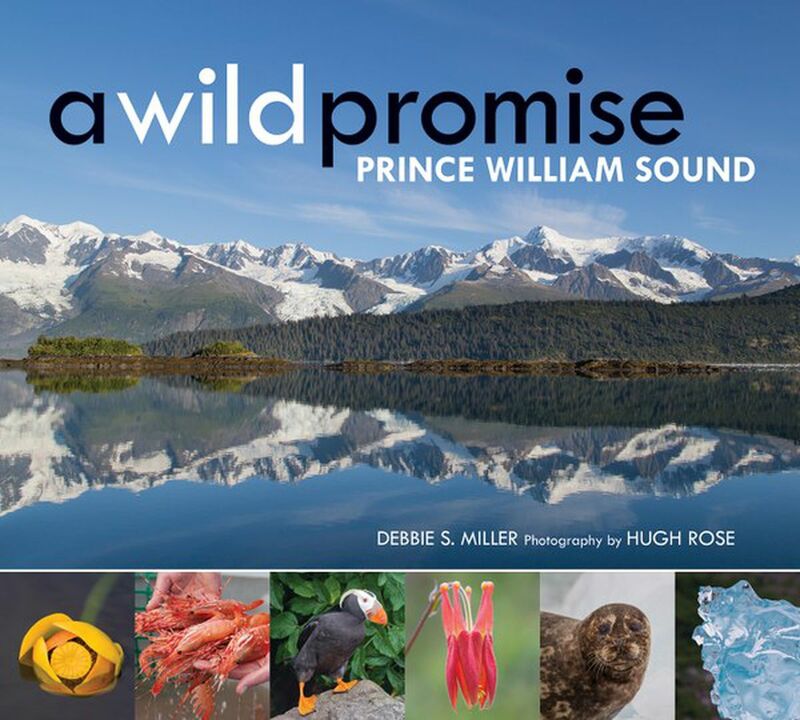 “A Wild Promise: Prince William Sound,” by Debbie S. Miller. Photography by Hugh Rose. By Debbie S. Miller. Photography by Hugh Rose. Braided River/Mountaineers Books, 2018. 176 pages. $29.95. Well-known Alaska writer Debbie Miller has teamed up with naturalist-guide and photographer Hugh Rose to produce this gorgeous, large-format book that celebrates a very special part of wild Alaska, "where land and sea are woven together." The high-quality photos speak loudly for their subjects, large and small — mountains and glaciers, wildlife, tiny flowers, striations on rock, bluest ice. The well-informed and often lyrical text details both Miller's personal explorations of the area and its cultural and natural history. This is a book with a mission, and that mission is not only to share an amazing place with readers but to advocate for its protection. The specific area (displayed on a map right at the start) is not the whole of Prince William Sound but what's known as the Nellie Juan-College Fiord Wilderness Study Area. Miller avoids the awkwardly long title by calling it, simply, the "Chugach wilderness." It covers most of the western half of Prince William Sound, from Elrington Island in the south into the Chugach Mountains and their glaciers in the north. The "study area" status originated in 1980, with passage of the Alaska National Interest Lands Conservation Act (ANILCA). As part of the act, 2.1 million acres of the 5.6-million-acre Chugach National Forest were set aside in an area to be studied for future designation as wilderness. After study, Congress was to determine what portions should receive wilderness status and what parts might be managed for multiple uses. Thirty-eight years later, after multiple studies and recommendations to Congress, the entire area remains in limbo, as "unfinished business." Congress has never acted on Forest Service recommendations developed with public input. Hence this book's title — "A Wild Promise." The promise is still out there, waiting to be fulfilled. An irony documented by Miller and Rose is that the area, so close to Anchorage and now road-connected via the Whittier Tunnel, is wilder today than it was for much of the past. Throughout the text, Miller details use of the area by the early Chugachmiut people and later by gold and copper miners, canneries and fox farmers. "Culturally modified trees" from which slabs of hemlock bark were cut for housing planks are found in the woods, along with rusted mining machinery. "At one time, there were three active gold mines, sixteen fox farms, and four salmon canneries in the region," Miller tells us. The authors are not suggesting that such extractive activities be reintroduced — only that we understand that the area has a human history as well as a natural one involving glaciers, earthquakes and ecosystem changes. Today, most use is recreational, and the authors build a strong case for protecting wilderness values that are increasingly rare anywhere else. As the rest of the world gets busier and noisier, a wild place crackling with glacier ice, mewing with baby otters and forested with twisted hemlocks and ancient cedar trees takes on significant new meaning. In addition to recreational and spiritual values, it offers a living laboratory for studying natural systems and climate change. Among its other attributes, the Chugach wilderness is home to the largest concentration of tidewater glaciers in America. The photos and descriptions of glaciers, glacier-carved landscapes, and floating ice are ones a reader will want to linger with. Most of these glaciers are now receding rapidly, with notable changes from year to year. A two-page spread in the middle of the book shows Columbia Glacier in 1983 and again today from the same location. The images are startling. The massive Columbia Glacier has retreated more than 12 miles in that time, its thickness and volume shrunk by half. Elsewhere, Miller brings to life the Harriman Alaska Expedition of 1899, which slipped past the toe of Barry Glacier into an unchartered fjord now known as Harriman Fjord; the expedition also named College Fjord and the glaciers within it. Miller researched John Muir's notes and drawings from that trip and shares some of both. One lovely feature of this book is insert panels identified as "snapshots." These portray individuals associated with the Chugach wilderness and serve to make the point that wild places need human stewards. One of these tells of biologist Kate McLaughlin, who lives in Chenega Bay (just outside the study area) and "runs the northernmost hummingbird banding station in America." She has captured more than 500 individual rufous hummingbirds in a single summer, including one previously banded in Florida. Another snapshot is of Scott Groves with the nonprofit Gulf of Alaska Keeper. That organization since 2005 has removed more than three million pounds of plastic debris from beaches, mostly on Montague Island, the long outer island that guards the sound. These clean-ups prevent debris from making its way into the wilderness area or from entering the food chain. Yet another snapshot tells of oyster farmer Dave Sczawinski and his permitted operation within the study area, as an example of a sustainable business that can be compatible with protections. Get this book for the beautiful and inspiring photographs, but then read every page of Miller's text. Marbled and Kittlitz's murrelets, ghost forests, staircase meadows, the return of sea otters, the legacy of the Exxon Valdez oil spill, the origin of the name "Chugach" — these are all here. You may even be moved to action — to work towards stewardship and permanent wilderness protection for, as Miller calls it, "this precious piece of the planet."